KLH Expands Bead Blasting Capabilities | KLH Industries Inc.
To better serve the needs of it's customers, KLH Industries has added a new 520-gallon GAMM glass bead blasting cabinet. This closed loop, dry system allows KLH to efficiently process large or difficult to handle parts. Bead blasting - which is similar to sand blasting but much less abrasive - is the process of propelling very fine glass beads against the surface of a material. 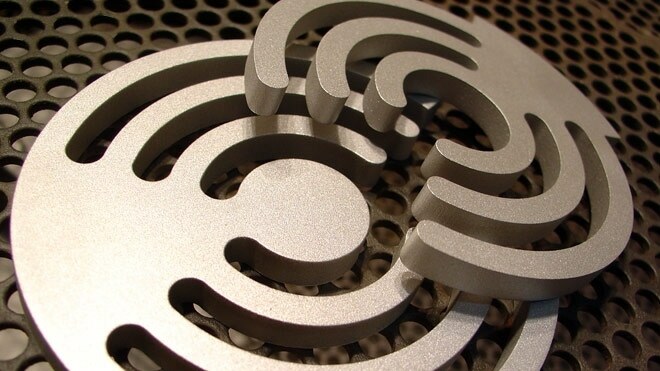 This process creates a uniform, smooth matte surface finish, as seen in the waterjet cut parts pictured above. For more information or applications of bead blasting, contact the sales manager at (800) 294-8363 x 252.